Despite some decent sales and a large number of fan art in pixiv of Sengoku Collection, this little show has gone relatively unnoticed. Practically no advertisement, unappealing art, and other shows taking the spotlight and it isn't too much of a surprise. That said I'd still like to make a decent review for people who might want to try it out. The show is overall mediocre. One of the main problems of Sengoku Collection is that it lacks any appealing or interesting plot. Sengoku warlords come to our world; they live their lives, some wish to stay while others want go back to the old world, like Oda Nobunaga. A good concept lies here but it is not executed well. Each episode is centers around a Sengoku-period warlord and each episode deals with said character's problem and how they cope with their new life. The problem is that the episodes are very loosely related to each other nor do they serve much semblance to main story, leaving the viewer with a show that is practically just slice-of-life. And really, some people might be fine with that, but why even attempt a main plot when you choose to not properly work on it? There is a certain nagging feeling once you finish the show that tells you this show could have been much more. The episodes and characters themselves are problematic as well. Some of the episodes are fantastic, some are mediocre, and some are just plain awful and a chore to go through. The good thing is that you might find a jewel of an episode you love while going through the muck; but you have to go through that said muck. The same can be said of the characters, some of which are horribly written and have so little relevance to their Sengoku image that they might as well not have been a Sengoku expy at all, while others are created with good thought and creativity. You may notice a number of parodies throughout the show as this was the little gimmick the show tries to play out. Probably something a lot of people will recognize is the Bowling for Columbine parody, one of the fewer funny and good episodes of the series. A lot of the parodies however are Japanese-related media so the average English viewer most likely will not get references. It probably doesn't need to be said that the animation and art is pretty low-tier. Just look at Kanetsugu Naoe's face and tell me you can actually take that seriously. It's even noticeable that in some episodes the production values and art drastically drop. Expect harsh disappointment for those who need grand visuals to keep you entertained. The music is fair and good in most regards. Dependent on the episode and parodies the music will have different styles and ensemble, and diversity is always a good thing. If you bother with the character songs that are still being released, they are pretty standard J-pop. Overall, Sengoku Collection is just average. There are episodes you will love and episodes that will having you sleeping from boredom. With poor visuals it makes it hard for an average viewer to be interested in finishing the whole 26 episodes. It really isn't something I can recommend to someone that doesn't have free time to spend. The posted plot synopsis from Crunchyroll is way off the mark really, first off their ages range from 4 to probably 30 and calling it some kind of friendship development story is stretching it halfway to the moon. What you can expect is a ton of females designed to appeal to every fairly common taste so everyone has something to look forward to, then they mostly get an episode each to do something amusing relating to their personalities and Oda Nobunaga shows up and defeats them in some entertaining manner. There is very little real violence going on, the selling point of the show is the comedy, which is nothing impressive but at least I giggled pretty frequently through the whole season. The art is all over the place with some characters looking like those horrid 2005 anime characters appearing to have downs syndrome but there are also opposite extremes with very stylish adult looks with high realism factor, I have no idea what in a bucket of soapy rubber ducks is going on with that but it sort of annoyed me a little. The sound is quite a lot better, in fact so good I can't find anything to complain about in the slightest! I spent a good while deciding between a 6 and a 7 for this show, it ultimately ended up with only a 6 but if you're just looking for something to make noise and pictures on your TV while you knit a scarf it's a good choice until you suddenly laugh and accidentally stab yourself. Sengoku Collection is a series of mostly unrelated short stories about samurai from another world wreaking havoc in this one. They do this not by fighting, but by being extremely eccentric. Each episode focuses on one character who is usually not seen again after that, but they are all complete stories, so this is not really an issue. There is an overarching plot, but it's sort of in the background for the most part. Sengoku collection is full of yuri, so steer clear if you don't like that. Otherwise, it's a beautiful, if strange show, and I highly recommend it. Sengoku Collection is an anime by in large, slice of life genred with a jack all of genres but master of none approach to it's plot structure. Sengoku Collection goes through MANY genre changes depending on the Sengoku girl that it's focusing on the episode, whether it be shounen, mystery, "horror", shoujo ai, idol, sci-fi and even space adventure, however how they present and execute it is rather lackluster and is only means to give the Sengoku girl at hand something to do. In terms of characters, considering the HUGE cast, almost 3/4's of the cast get at best one episode tops for thier episode focus, the only characters that matter in terms of a narrative focus for LA at least were Oda Nobunaga voiced by Rumi Ookubo (Oda Nobunaga coming into other character's end scenes to collect their secret treasure so occasionally appears here and there), Masamune Date voiced by Ayumi Tsunematsu and Mitsuhide Akechi voiced by Yoko Hisaka and all three get three episodes at best for thier story "arc". In terms of character development, the episodic nature of the anime can either give most of the charcacters stock cliches tropes or genre-fueled tropes for the Sengoku girls at hand and because of that, their character development especially the characters given one or two episodes worth of "development" is miniscule at best thus making those Sengoku girls' prescences feel rather worthless and filler. LA's favourite episodes of this anime were Episode 18, 19, 20 and 22 by the way and LA has some guilty pleasure towards Episode 23 for it's creative take on a documentary narrative through a kindergarten's sandbox takeover. On the side of the spectrum LA got quickly bored of epsiodes 2, 7, 12 and 21. The only 2 episodes LA thought was in middle of all this was Episode 13 and 16. In terms of animation by Brain's Base, the animation has inconstistency concerning the character designs clashing with the background, as the background animation is very detailed using bright pastel and watercolored background work (special note goes to Episode 18 making it look like a depressing children's book style) that clashes heavily with the traditional yet equally bright character designs (with facial and character animation derps abound), LA would praise Brain's Base doing something unique using the background animation but equally fault them for having inconsistent character designs, animation errors (Exception goes to Masamune Date's character design as it fits with her with no animation errors either) and to be frank when there are battles between the Sengoku girls or battle scenes in general feel janky and stiff, the animation overall is inconsistent at best, lazy at worst. In terms of voice acting, considering the vast cast list, LA will give it that there are some level of "squeak" in the voice cast. But aside from that major props for voice acting goes to Rumi Ookubo as Oda Nobunaga (playing up the abrasive and slight tsundere type), Ayumi Tsunemastu as Masamune Date and Yoko Hisaka as Mitsuhide Akechi especially (as thier episodes were where LA gave any investment to characters in the series). 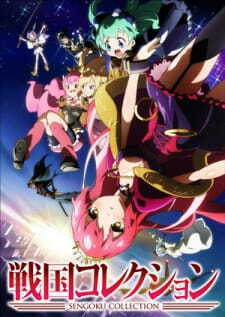 The ending had the common decency to bring us something of what LA was expecting from this anime, "Sengoku girls fighting it out with the slice of life tones to it" and at least they gave something of a epilogue to the huge cast of characters EXCEPT Oda Nobunaga's main narrative plotline, essentially saying it's never gonna get resolved, at least giving us how the other Sengoku girls are is a slight bonus???...-sigh-. Sengoku Collection, well LA will say it again, a jack of all genres but master of none and LA WILL give anime some grace as it IS a slice of life anime with Sengoku girls as it's focus but outside of it's "slice of life" genre to be perfectly honest LA got bored of this series quickly as it had no narrative hook to keep LA interested with the "one episode Sengoku girls" being essentially worthless to the overall narrative of Oda Nobunaga or Masamune's. On a off hand note, LA thought the premise of Sengoku girls being transported to the modern day although a good concept, it's execution lacked at any meat to it's product (and no not for being a slice of life), they could have done ALOT more to it (the closest it got was Masamune's story arc). Sengoku Collection like it's title is a collection of Sengoku girls with a character-centred slice of life anime, if you like that and want something more laxxed (which was why LA watched this anime in the first place) then it's an ok choice, however if you wanted to see Sengoku girls going crazy with swords shounen style and go to war in modern day Japan...then it's better to look at the reverse-concept anime "Oda Nobuna no Yabou" as that had a better concept and execution.